At preschool they celebrated Abby's Birthday. She wanted donuts (with sprinkles) for her treat! Audrey has to be right in the middle, just like all the big kids! Thanks Miss Char for making Abby feel so special! What a fun day we had!! Our Abby turns 4 on December 9th, so we decided to have a princess party for her. Abby has loved princesses for the last year and a half straight! So we thought this was a perfect opportunity to have a bunch a girlie girls over to celebrate out cute Abby!! We had a house full of little 3 and 4 year olds...I was a little nervous, but they were great! When they arrived we put special princess makeup on. We played a bunch of fun games, pin the crown on the princess, the princess and the pea( the girls had to sit on three pillows and decide which pillow the pea (golf ball) was under, pass the crown (hot potato) and then we made beautiful crowns and mirrors for each princess. Each of the girls enjoyed a pink cupcake with pink lemonade! We opened presents that were all fit for a princess (thank you) and the girls played and played!! The girls in front of the huge Christmas tree in the Davenport. 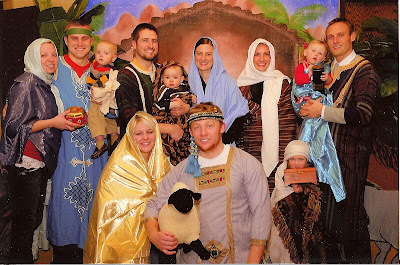 Then on Sunday night we went to the Nativities Around the World that is hosted by our Spokane Stake. It is a really fun tradition to do every year and is also a great missionary opportunity! There are over 800 Nativities from around the world that are displayed beautifully, they also have a place to dress up and take nativity photos (which we couldn't leave without doing!) There is a kids area with stories, coloring, and kids nativities to play with. We had such a fun night with our friends as you can see from the picture! sticky face Audrey...suckers are the best!! The day after Thanksgiving we headed over to Cour DE Alene for the annual light parade. It was cold and snowing, which soon turned to rain, but we still had a good time! The kids got to see Santa in the Parade, and then after they had a firework show. It was crazy to see fireworks when there was such a huge cloud cover. You could see light behind the clouds when they would go off and a few got down low enough for us to see them. We had a fun time and definitely froze, but it's a good memory! So the last week has been really crazy for us! Levi has been studying like a mad man for finals and on top of that he has had to be at tithing settlement. I have had the Young Women in Excellence Program (and set up the night before), Feeding the missionaries, Hair appointments, Abby's birthday party, and teaching the lesson for Young Women's on Sunday...not to mention trying to get everything ready to go to Utah for Christmas! So we had a few minutes on Tuesday night before I had to head to set up for YW so we decided to decorate the tree. The girls absolutely loved it...Audrey was so funny, she watch Abby and I for a few seconds and then jumped right in hanging up as many ornaments as she could! If you look at the bottom of the tree you can see Audrey's contribution:)! Abby decided to take one side of the tree and put all her ornaments on it...she even figured out a way to hang her princess sunglasses on the tree. I am glad that we decided to get a tree this year (we were really close to not getting one) the girls really enjoyed decorating it and it help us to get into the Christmas Spirit and make some great memories! I had to take a pic of the girls right before we headed out the door (I was passing them off to Levi at the Church so I could decorate for YW...that's why they are in their jammies). We had a great Thanksgiving this year. Levi was too crazy with school to allow us to go to Utah, so we got some friends together and enjoyed the holiday! It was a small group but it was really nice to be able to relax and really enjoy the meal and company. Our friends Mandy and Colby hosted it at their house. She did such a great job decorating and made the table look so beautiful! Paige and Bryce made the turkey and it was also so beautiful! She displayed it with parsley, orange slices and cranberries. Not only did it look beautiful but it tasted spectacular! The kids had a great time playing and eating too! Audrey enjoying a little banana cream pie!